1 Which Britney Spears song did Mark Ronson cover on his Version album in 2007? 2 Which act has just released Let Somebody Love You, their first single in nearly two decades? 3 Luther Vandross teamed up with which singer for The Best Things In Life Are Free? 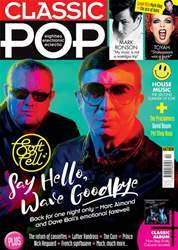 4 Who covered Soft Cell’s Say Hello, Wave Goodbye for his multi-million-selling album of 1998? 5 Toyah Willcox is married to which legendary prog-rock guitarist? 6 Level 42’s Mark King is in a rock supergroup with Police drummer Stewart Copeland. What is it called?